Follow these 3 easy steps to send a fax from Email. Open your Email program and create a new Email message just like you normally would do. In the “To” field enter the destination Fax Number followed by “@srfax.com”. The destination fax number must include the Country Code + Area Code + Number. 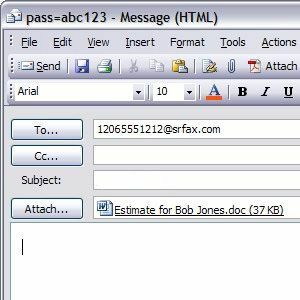 Attach the document(s) you want to send as a fax from Email. Supported file types include Microsoft Word, Excel, PowerPoint, Snapshot, PDF, Text files and HTML to name a few. You can attach as many documents as you like and they will be faxed in the order they are attached. A cover page will not be generated if there is no text in the body of the email. In order include the default cover page as designated on your account, please have any alpha-numeric characters in the body of the email. The subject of your email will be the subject of your cover page and the To/From fields will default to the information associated with the email addresses. Click on “Send” to send the fax via email. 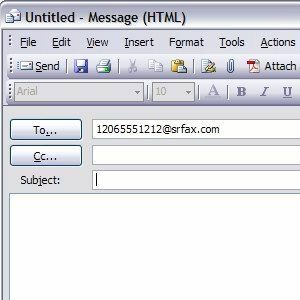 SRFax will convert the Email and the attachments to a fax format, and then fax these to the number you specified in the “To” field. Once the fax has completed, you will receive an Email notification of the fax transmission status. Done! That’s how EASY it is to send a fax by Email! That’s why SRFax is the best Fax To Email Solution currently available.